← The emptying of the ocean. 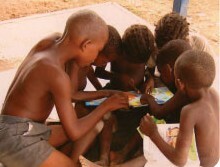 Children who are hungry to read and starving to learn. No, I’m not referring to our kids, who have to be threatened with the removal of all personal electronic devices before they will deign to do their summer reading assignments. I’m talking about the 370 million children in Africa, 40% of whom do not attend school, the vast majority of whom have never owned a book, and who would be thrilled beyond belief with a chance to get an education and change their lives. 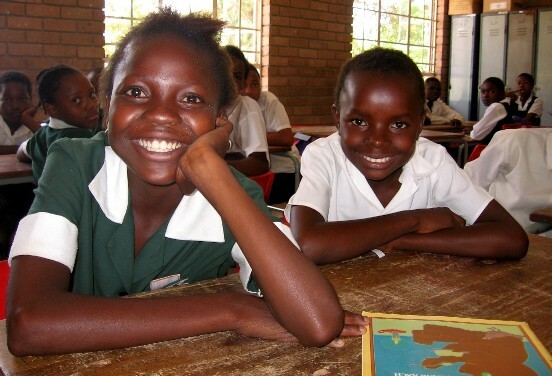 The children Books for Africa was created to serve. 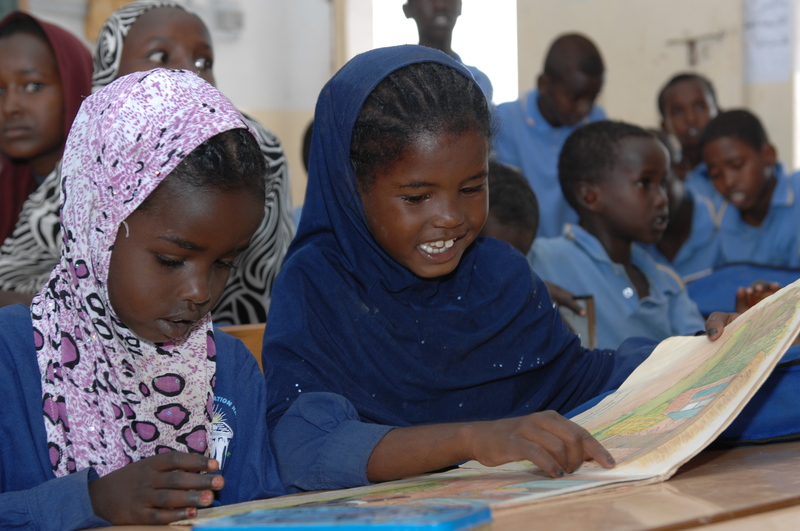 Girls in Djibouti with new books from Books for Africa. From its modest offices in St. Paul, Minnesota, with a total staff of 10, Books for Africa has become the largest shipper of donated books to Africa – sending 22 million books to 45 African countries over the past 22 years. It all began in 1988, when St. Paul publisher Tom Warth went to Jinja, Uganda to visit a Ugandan friend, and they happened upon a library. It was a beautiful space, but there were about 10 books in it, most over 25 years old. Warth came home, met with some friends from the Minnesota Book Publishers’ Roundtable, and started Books for Africa – with the plan to reclaim books headed for American landfills and put them into the hands of African children who have never before held one. But it costs money to ship huge quantities of books: a container that holds 22,000 books weighs 20 tons and costs $10,000 to ship. 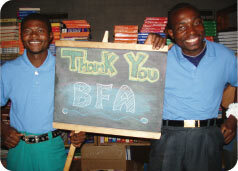 So Books for Africa devised a brilliant system that leverages the power of volunteers across the country who collect donated books, ship them to BFA’s warehouse in Atlanta, sort and pack them, and raise money for shipping. 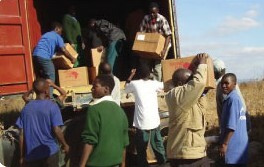 It then connects them with organizations in Africa that have requested the books and can receive and transport the shipment, and get the books on the shelves of libraries, universities, schools, orphanages, and community centers in these countries. It’s incredibly efficient and effective– but every day, more letters from Africa begging for books come flooding in. In South Africa, excited to read! “Though there are no chairs or tables in our library, and only a ragged carpet on a cement floor, the children line up outside, waiting anxiously for me to open every afternoon, excited to look through and read, yet again, the same book they read yesterday. “The children spend long afternoons flipping mesmerized through picture books, tracing words with their fingers, asking for definitions or explanations. The library has become a place that not only creates a love of reading, but offers and inspires an interest in English, the national language of this still newly independent nation, and an awareness of a world outside the hostel walls. Well, I couldn’t say it any better than that! I’m giving $100 to Books for Africa today to ship 200 books to Africa …and then I’m donating all the books my daughter didn’t read this summer to Better World Books (see post 6/2), an online new & used book seller and gigantic supporter of Books for Africa. (And I just decided I’m giving all the lovely grads I owe presents to a donation to BFA in their names!) To join me, click here! Books For Africa, everyday a destiny is changed through books. 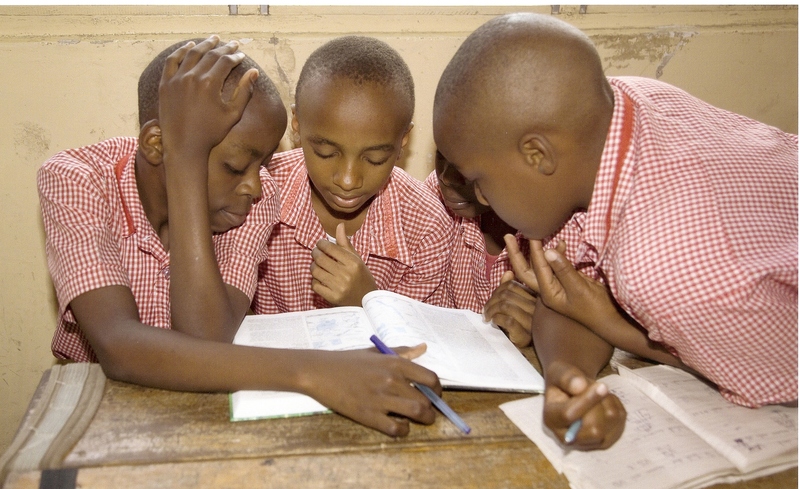 Everyday, poverty is reduced through knowledge acquired through books. Everyday, the world gets better through someones generosity which pushes a book into hands of many many who otherwise may never have access to the information required to change lives and communities. Thanks to God for BFA and all Friends and Supporters for this great work around the globe! What in inspiring story. Many of us in the United States are in need…..some for the first time in their lives. But here…even at our worst…..we have far more than they. Even though at this time I am not financially able to help…..thanks to your story, perhaps in near future I will be able to do something. You are incredible for keeping us informed on a “real” human level. Fun to read this today: my parents just spent several hours this past weekend as volunteers packing a bunch of books for Books for Africa!